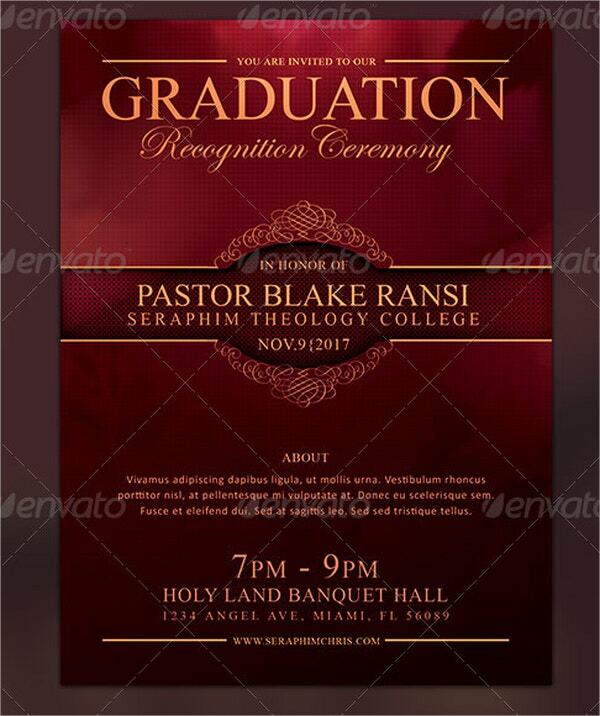 Graduation flyers come with spectacular designs and are apt for use in special occasions like college graduation. 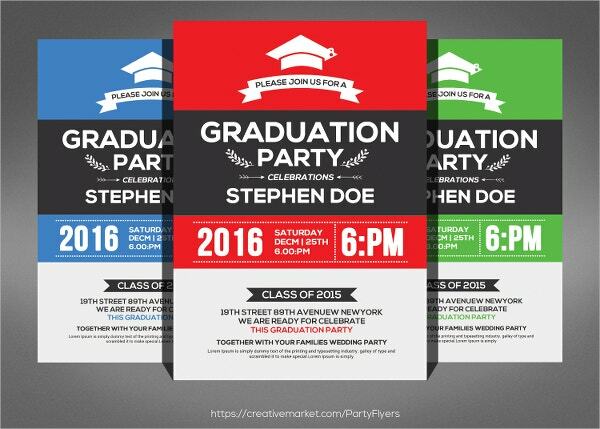 These flyer templates are easily editable and allow adding images, changing colors and fonts. They also allow adding college photos to make the event memorable. They allow sharing with social media and printing the flyers with high definition resolution. You may also see flyer designs. They are easy-to-use and do not require graphic designing expertise. 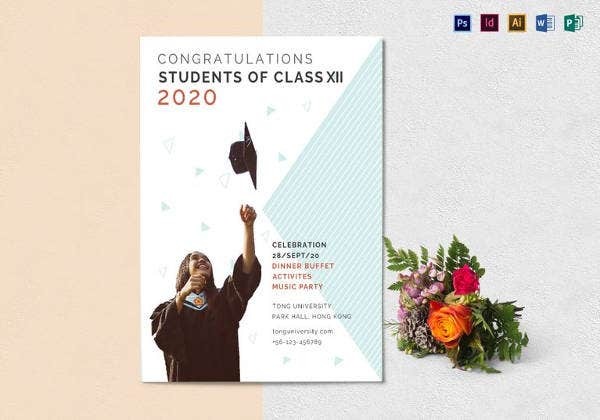 To know more about these Free Flyers, one can search Google using “graduation flyers pictures”, “graduation flyers examples”, “graduation invitations templates”, “graduation invitations templates free 2012” or “create graduation flyer”. 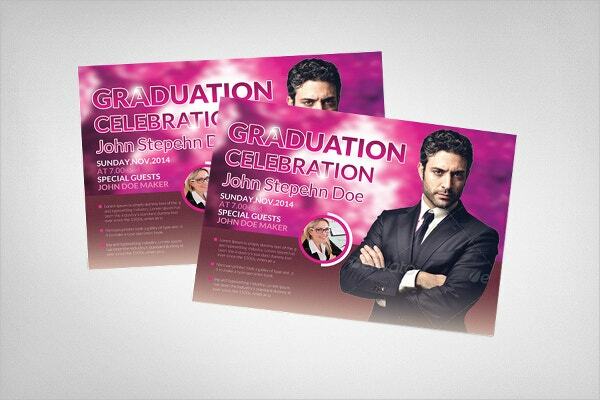 This flyer is highly ideal for events like graduation and ceremonies which need stylish looks. It comes with six color options, high quality and tutorials. It comes with layers and is easy to edit. This flyer comes with layers and well labeled folders. It is suitable for use in night party events and each element is perfectly designed as well as editable. It comes with CMYK colors and printer ready format. 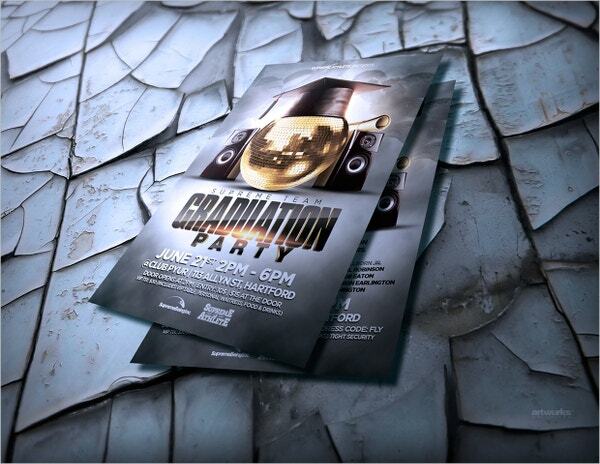 This graduation party flyer comes with a spectacular design and it is completely layered. It presents categorized layers and comes with editable PSD files. It has a help file and a printer friendly format. 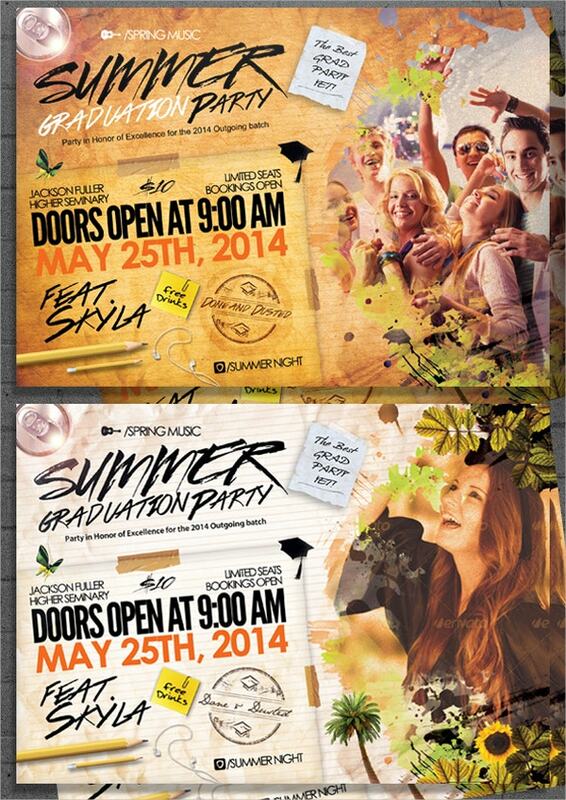 This graduation party flyer comes with editable PSD file and printer friendly format. It comes with 300 Dpi resolutions and CMYK colors. It is ideal for use in club parties, semester parties and festivals. 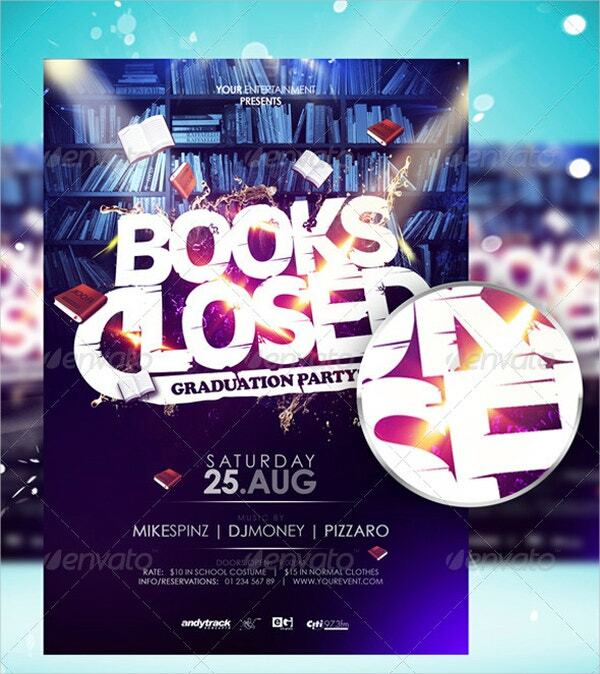 This flyer comes with completely editable PSD Flyer files and colored layers. It is an extremely easy-to-use template and allows customizing all elements including texts, colors and images. It is ideal for college parties. 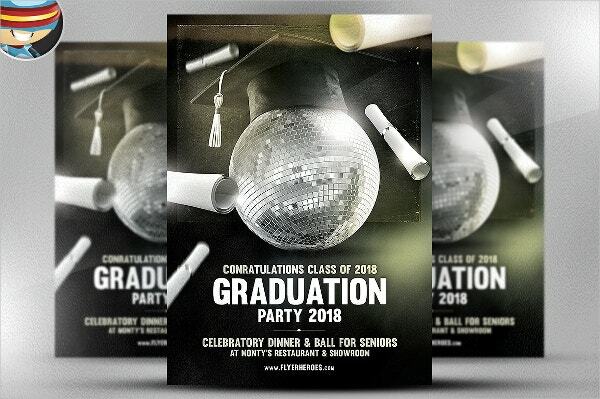 This graduation Party Flyer comes with an attractive design and it is completely editable. 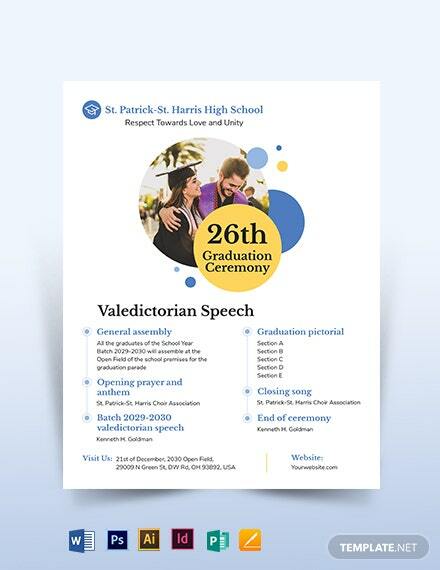 It comes with printer friendly format and is useful for any parties like graduation ceremony and special occasions. This flyer comes with professionally designed templates in ten different colors. It has 300 Dpi resolutions and supports CMYK colors. 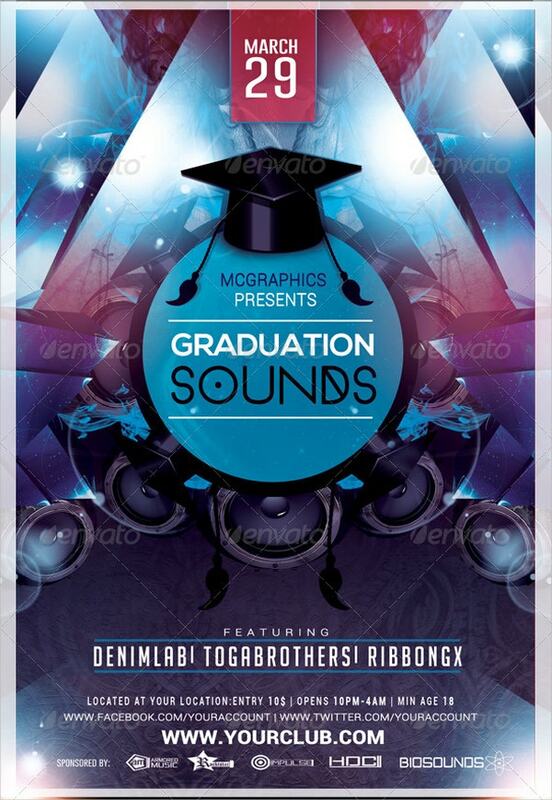 It provides printer friendly format and is useful for special events like graduation, music or dance. 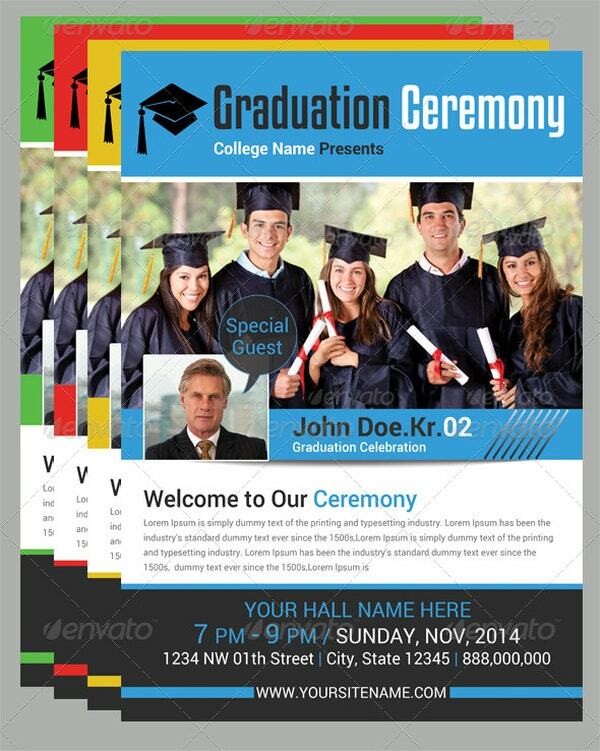 This flyer comes with fully layered PSD files and supports CMYK colors. It has free fonts and three different colors. 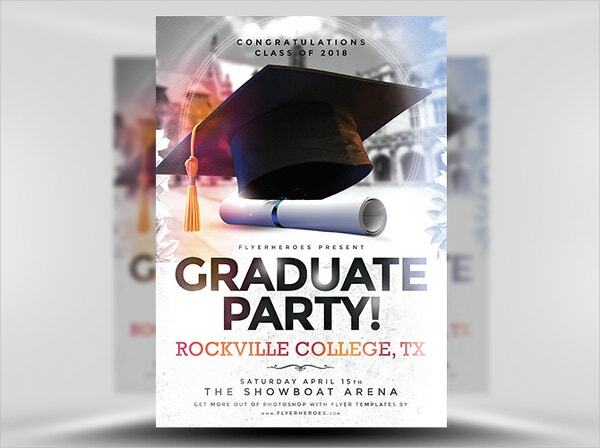 This flyer is extremely useful for party invitations like graduation, music or rock concerts. This flyer comes with CMYK colors and is simple in design yet provides elegance. 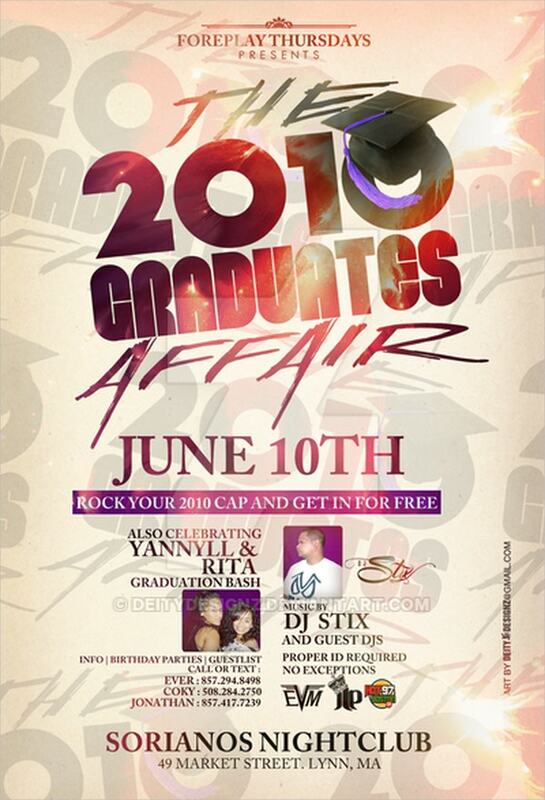 This flyer is completely editable and has great colors and is ideal for events like birthday bash or graduation bash. This flyer comes with 300 Dpi resolutions and CMYK colors. It provides completely layered PSD file and easily editable logos and texts. It comes with editable layers organized as well as bleed and crop marks areas. This flyer comes with a simple and clean design. It provides CMYK colors and enables easy customization including texts, images and colors. 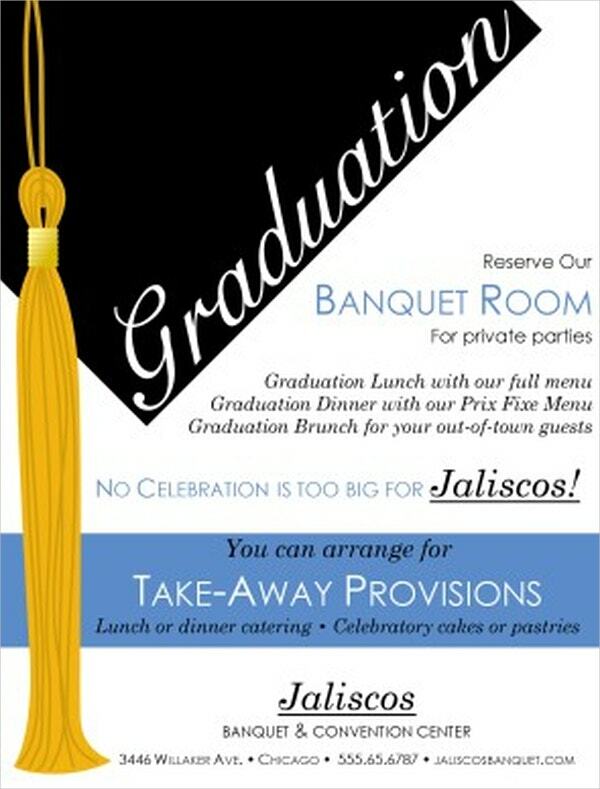 It is useful for graduation parties for grand celebrations. 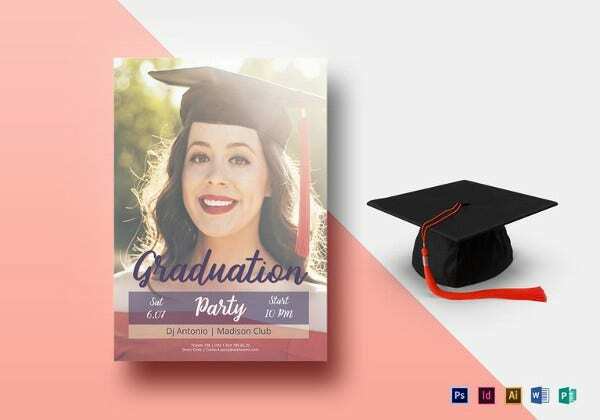 This flexible PSD file flyer comes with editable features. It allows editing texts, colors and images. It comes with CMYK colors and printer friendly format. It is ideal for graduation party events. 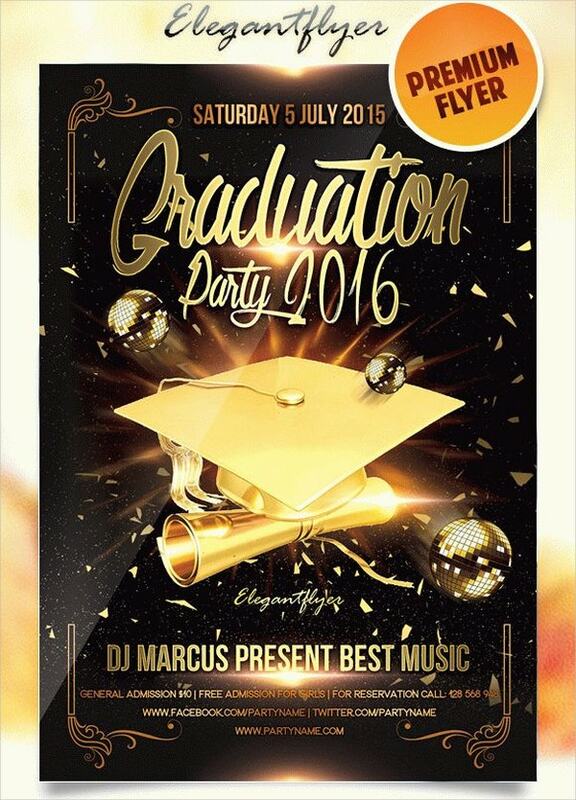 This flyer enables promoting graduation party with the best designed template. It allows easy customization of text, colors and logos. It comes with layered file, CMYK colors and 300 Dpi resolution. This flyer comes with editable text layers and free fonts. It provides three different colors and includes help file. It comes with 300 Dpi resolution and CMYK colors. 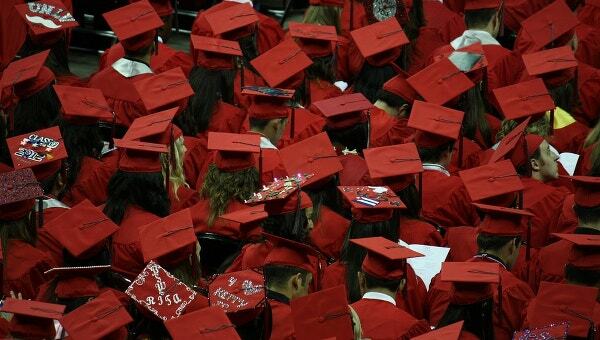 It is extremely useful for graduation celebrations. 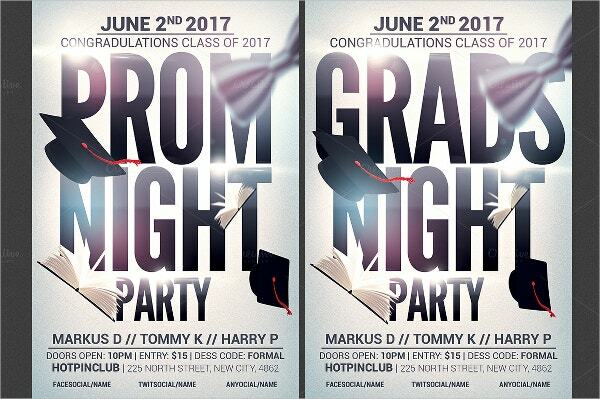 This flyer is ideal for use in high school graduation events. It comes with best script and 8.5 x 11 inch size. It is completely editable and looks very gorgeous. 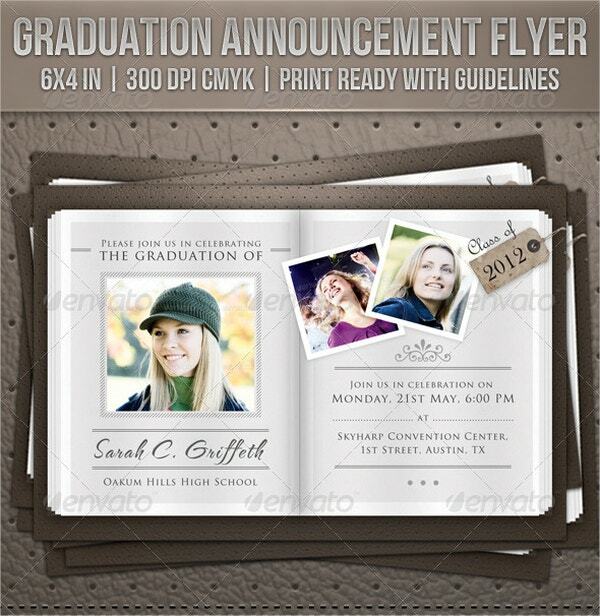 Graduation flyers which are extensively used for college graduation parties are also called college flyers. They come with professionally designed layouts and allow customizing the words in the templates. 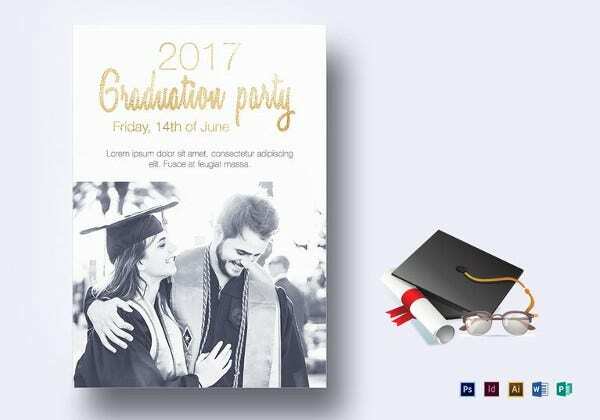 One can search Google using graduation invitations wording or graduation quotes and design enchanting graduation flyers. They are also useful for events like music and dance concerts.